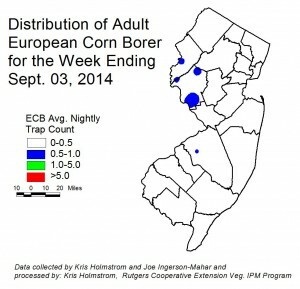 European Corn Borer (ECB) adult activity has declined further, with only pockets of activity in northern parts of the state (see ECB map). Overall activity is low. Whorl and pre-tassel stage feeding is interspersed with more dominant fall armyworm (FAW) feeding. As always, consider treating if 12% or more plants exhibit ECB feeding alone, or in combination with FAW (see below) injury. Remember to make a full-tassel application to control ECB larvae as they leave the tassel and travel down the stalk to re-enter the plant near the ear shank. This last application is often critical to controlling ear infestations from ECB. Blacklight Trap: The number of corn earworm moths (CEW) captured in traps has increased, but the range of traps catching moths has not expanded (see CEW blacklight map). Catches are primarily in the south and central counties with only scattered individuals north of Trenton. Overall activity is low for this time of year. Catches in Virginia and North Carolina are reasonably low, so it is not clear whether a large migratory influx will occur this season. Delaware catches are similar to our southern NJ catches. Even at these low levels, CEW can cause significant injury to sweet corn ears. Pheromone Trap: CEW pheromone trap catches were fairly stable over the past week, although Cape May traps registered higher numbers. 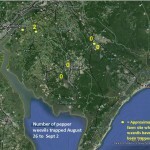 Highest activity is still from the Atlantic – Camden County border south through Cape May (see CEW pheromone trap map). The green area on the map roughly corresponds to a 4-day silk spray schedule. Low spots within the broader green area should be considered outliers, and grower near those areas should defer to the more conservative schedule. Sweet corn plantings now in silk in southern NJ are at risk for ear infestation if CEW is not properly controlled. Fall armyworm (FAW) infestations remain common, and are occurring in very young plantings. It is important that all plantings be scouted regularly for this pest. FAW caterpillars consume corn foliage, and produce large quantities of feces that pile up within the whorl. FAW larvae typically have light and dark brown bands, and the head capsule has a distinctive upside-down “Y” pattern on it. Unlike ECB, FAW will feed on corn plantings in the seedling stage, although whorl stage is usually the first to be affected. Consider treating if the number of plants infested with FAW either alone, or in combination with ECB exceeds 12%. FAW may be difficult to control with pyrethroid insecticides. Newer materials, including spinosad-based insecticides, as well as those including active ingredients chlorantraniliprole and flubendiamide are effective against BAW. With ECB moths emerging in some areas, treatments may become necessary to prevent infestations. As ECB warrants control (local blacklight catches at 1/night), consider an insecticide that is not destructive to predators and parasites of aphids and TSSM. These include Coragen and Belt (or Synapse). Beet armyworm (BAW) have been captured in southern counties. Most traps are catching just a few moths, but recently traps in the Folsom area averaged 15/night and in the Woodstown area, nearly 12/night for the past week. BAW larvae will feed on leaves near the growing terminals of the plants, resulting in shredded foliage at the top. As the larvae molt and grow larger, they will begin feeding on fruit. BAW, like FAW is difficult to manage with pyrethroid insecticides. Materials that are recommended for FAW control (see the FAW paragraph above), will also be effective against BAW. 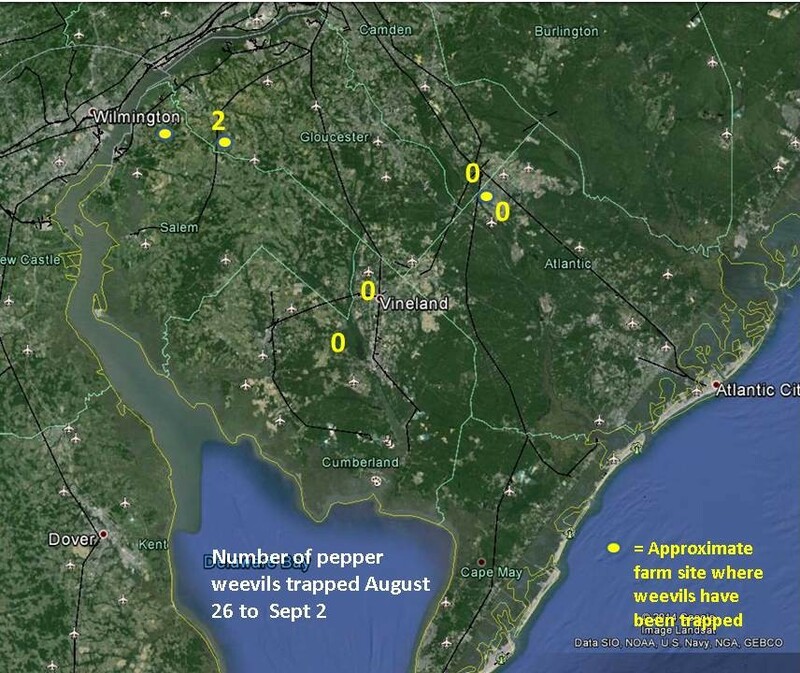 Pepper Weevil Report: Pepper weevils continue to be caught at a trap near one produce handling facility (see pepper weevil map), though the numbers are much below 2013 levels for this time of year. A single weevil was caught in a field near Swedesboro. It is unknown whether this is a straggler or represents a light infestation. Infestations occurring at this time of year probably won’t result in much crop loss, even if ignored. How aggressively farmers attempt to control pepper weevil in September would largely be dictated by market price and growing conditions. Two-spotted spider mite (TSSM) populations have become more common in tomatoes as drier weather dominated in the northern counties these past several weeks. Initially, this pest may go unnoticed. As numbers increase, foliage will become yellow, and ultimately turn brown and dry. At this point, TSSM webbing will be obvious, connecting leaves so that mites can move about the plant to less populated areas. TSSM is best managed while still at low levels. Look for the mite “stipple” (whitish pin-spots), indicating a low level population under the affected leaf. If this sign of infestation is present in multiple sites within the field, consider applying one of the newer miticides. There are a number of effective materials that have very short pre-harvest intervals. Consult the 2014 Commercial Vegetable Production Recommendations for specific insecticide recommendations. 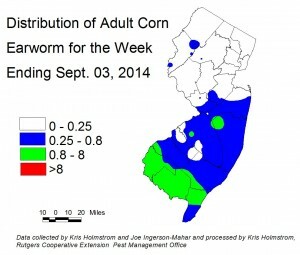 Thrips have become a problem in a number of northern NJ fields. Dry conditions for the past several weeks in the northern counties have been favorable for thrips population buildup. These small, yellow (western flower thrips are the most common) insects often go unnoticed until harvest, when the gold “fleck” injury is found on red fruit (see photo). This superficial injury is the result of thrips feeding on the fruit surface. 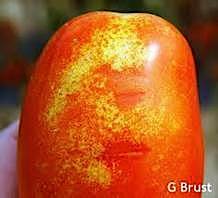 Low levels of this injury typically are overlooked, but as populations build, fruit can become heavily mottled with this “fleck”. Initially, thrips may be found in blossom clusters by tapping the clusters over an index card. As populations increase, thrips will begin to feed on the lower surface of leaves, causing pale areas that are visible from the upper surface. Inspection of the lower surface will reveal thrips adults and the wingless nymphs actively feeding. As populations rise to the level that causes foliar injury, control may be warranted. Unfortunately, thrips are difficult to control. Typically, best control is achieved with a rotation of foliar neo-nicotinoid materials and spinosad based materials. Consult the 2014 Commercial Vegetable Production Recommendations for specific insecticide recommendations. 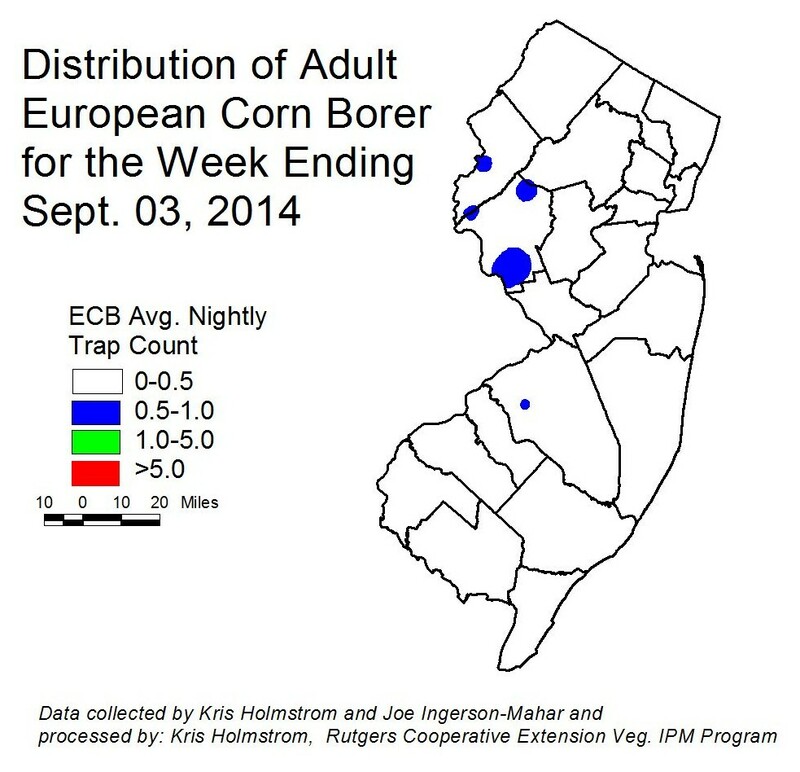 BMSB activity is extremely low, although a significant spike occurred in one Cape May blacklight trap. The Green Creek trap went from 0/night late last week to 24/night over the weekend. It is possible that a preferred food source was disturbed or degraded nearby, but the exact reason is not clear at this time. It remains to be seen whether this is a sign of higher BMSB activity to come, or simply an anomaly. Adult activity continues to be well behind previous years. If adult captures increase to 5/night for a full week, maps will be produced to show where activity is highest. Information on scouting, crop injury and control will also be included. Cucurbit downy mildew (CDM) is active on cucumbers in New Jersey. Reports from PA and NY indicate that DM is impacting cucumbers there as well. As of Tuesday, IPM personnel have detected no other cucurbit crops with DM infections. However, given the virulence of CDM, it is advisable that pumpkin growers begin to add fungicides that specifically target CDM to their regular protectant program for powdery mildew (PM). The CDM website http://cdm.ipmpipe.org/ indicates little chance of spread into New Jersey at this time. Heavy dew periods will cause existing field infections to worsen unless excellent coverage with proper fungicides is achieved. The CDM website should be a “favorite” on every grower’s web browser. It is advisable that all growers scout crops at least twice a week. Any further occurrence will be reported in this newsletter and will also generate an alert to all subscribers. Powdery mildew (PM) thresholds have been reached in all areas. Check upper and lower surfaces of 2 mature leaves per plant on 5 consecutive plants each, in 10 locations throughout the field. When PM lesions are found on 2 or more leaves, begin a weekly protectant fungicide program. See the 2014 Commercial Vegetable Production Recommendations for materials useful in managing CDM and PM. It is critical that recommended fungicides be rotated to reduce the possibility of the organism developing resistance to effective materials. Many of the fall plantings have been or are becoming established now. Cabbage looper (CL) infestations are fairly common, as well as diamondback moth (DBM), imported cabbage worm (ICW). Scout plantings weekly. Check 5 consecutive plants each in 10 random locations throughout the planting, paying particular attention to the innermost leaves where ICW often feed. Consider treating if caterpillars are found on 10% or more plants that are in the 0-9 true leaf stage. From 9-leaf to the early head stage (in broccoli, cauliflower and cabbage) infestations up to 20% may be tolerated. Once heads begin to form, a 5% threshold should be observed to protect the marketable portion of the plant. For leafy greens such as collards and kale, 10% plants infested is the threshold throughout. It is important to identify DBM correctly, because if it present, synthetic pyrethroid insecticides may not provide acceptable control. DBM larvae are small, and taper toward both ends. They thrash vigorously when disturbed.